The National Clean Cookstove Scheme (NCCS) is an initiative of the Federal Government of Nigeria aimed at improving the health of rural women, creating wealth and saving the environment through the distribution of cleaner cooking fuels. Though laudable in terms of project design and core objectives, several questions regarding the implementation of the NCCS remain. On September 27 2015, Spaces for Change’s Ndutimobong Enang met with Mr. Hamzat Lawal, the Executive Director of Connected Development and team- lead, ‘Follow-the-Money’ (FTM) to discuss the impediments to the NCCS initiative and the way forward. S4C: Did the Federal Government conduct any needs-assessment before initiating this project? Hamzat: No, the Federal Ministry of Environment (FMOE) did not carry out any needs assessment. 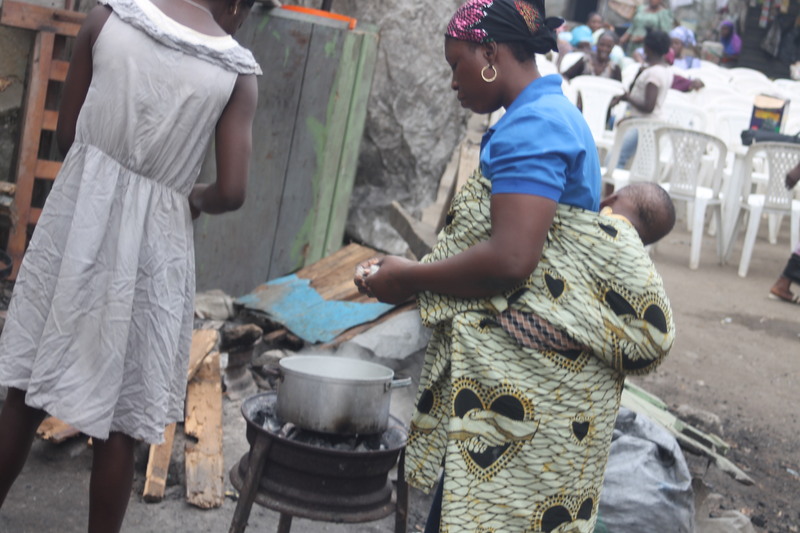 FTM requested the Federal Government to show us the work-plan detailing the supply and equitable distribution of the stoves, but they could not provide any. The only public documents which hint on the need for cleaner cooking fuels are studies conducted by organizations like the World Health Organization (WHO) which reveal that indoor pollution is 3rd highest killer in Nigeria and that 3% of the forest reserves is depleted yearly. S4C: How many contractors were appointed for the acquisition of these stoves? Hamzat: There’s only one contractor: Intergra Renewable Energy Services Limited. S4C: How many stoves were imported by Intergra Renewable Energy Services Limited? And how were they distributed? Hamzat: 200,000 stoves were reportedly purchased with N1.2b, but FTM can confirm that these stoves have not arrived the country. As such, no rural woman has received any stoves. About 45,000 cookstoves that have been imported so far are currently stored at the Velodrome of the National Stadium. It is important to clarify that the 45,000 stoves came from the N60m appropriated under the 2014 budget for the same purpose, and not from the sums budgeted for the NCCS Scheme. S4C: How many wonderbags have been imported? Hamzat: No wonderbags have been imported, to the best of our knowledge. Upon receiving an approval for inspection from Intergra Renewable Energy Services Limited, we were able to count and verify the purchase of 45,000 stoves which are still currently stored in the velodrome of the National stadium. 70 percent of them are empty LPG cylinders labeled NCCS – National Clean Cookstove Scheme. S4C: Were any of the 45,000 stoves locally sourced? Hamzat: FMOE is a member of the National Alliance for Clean Cookstoves which has a mandate to distribute 10million stoves by 2020. By its membership of this network, the Federal Government is aware of a ton of Nigerian entrepreneurs and women who have created their own brands or produced cookstoves stoves locally using available raw materials. FTM can confirm that none of the 45,000 stoves were sourced locally and we are not aware of any plans to buy stoves from these homegrown entrepreneurs. S4C: What is the Federal Ministry of Environment’s distribution plan for the 45,000 cookstoves that are available? Hamzat: In January 2015, we invited the ministry and the contractor to a forum where we demanded to know how they the stoves will be distributed. The Minister said they’d do so through the mechanisms determined by the wives of local government chairmen and the state governors. They federal ministry has reviewed this plan and notified us that the stoves will instead, be distributed through faith-based and also non-governmental organizations. The National Orientation Agency pledged to help create awareness; but till this day, we are not aware of any government-led awareness-raising activities around the use of clean cook stoves. S4C: Who are the target beneficiaries of the cookstoves? According to the then Federal Minister for Environment, Mallam Lawrencia Laraba Mallam, rural women who use e-wallet are the intended beneficiaries. The rationale is also that the savings made from the purchase of firewood would help them reinvest in key areas such as education for their kids. S4C: Beyond the delivery of the initial cookstoves, is there a plan to sustain the delivery of clean cooking fuels to rural women in Nigeria? Hamzat: That was also our question to the FMOE. Part of their plan is to have mobile re-filler hubs to help sustain the program and create jobs. However, there’s yet to be infrastructure for that and we hope these hubs will be safe. We would rather like to see a diversion to ethanol cookstoves partly because of safety and retail considerations. S4C: What is the status of the contract for the supply of cookstoves? Hamzat: The FMOE considered terminating the cook-stove contract. Intergra Renewable Energy Services Limited protested the ministry’s proposed contract termination, arguing that the contract was approved by the Federal Executive Council. They have filed a lawsuit against the FMOE for the proposed cancellation and requested the partnering financial institution to stop funding the project. Based on stakeholder recommendations, we wrote Integra Limited requesting a copy of the contract document for an independent review, but this request was denied because the contract contained non-disclosure clauses. They also affirmed in their reply that the only money they have received from the FMOE is N1,253,778,750. So, we are waiting to see if the contract will be terminated by the current administration. S4C: Has the FOI law helped your search for information so far? Hamzat: We wrote many letters to several government ministries and agents on this issue pursuant to the Freedom of Information Act (FOIA). Most of the time, they never replied. We wrote to the Federal Ministry of Environment, the Ecological Fund office, Secretary to the Federal Government, and the Presidency. The Ministry of Environment only wrote back recently stating they could not answer our questions about the cookstove program because the case is now in court. The Ecological Fund Office and the Secretary to the Federal Government never responded. We still await a response to our request to the Presidency for a copy of the handover notes the former Minister of Environment submitted to the present administration. If we get a reply, this could help our work as we plan to build a case with the EFCC to probe the entire process. To support our information-gathering process, we convene public forums which create a platform for government officials to interact with the media. S4C: Since “Follow-the-money” (FTM) has evaluated the process, what would be your recommendations if the program were to continue? First, we are monitoring this process to ensure accountability. We strongly recommend that a needs-assessment be conducted, a work plan prepared and that such a plan take into consideration what Nigerians now call federal character as a step to equitable distribution of the stoves. We also recommend that the supply plan should include quotas for the purchase of these stoves from Nigerian manufacturers in order to encourage local enterprise and job creation. We can take a cue from the Kenyan government which is empowering up to 3,000 youth to make millions of cookstoves for local use and export to neighboring countries.